voters, as a way to compensate for his deafness. so that they can give tours for deaf travelers. Unlock the phone with CapTelÂ® Captioned Telephone! that they say – Like captions on TV â€“ for the phone! tell him secrets he never knew in the past. 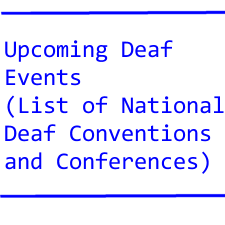 news” is not good for the deaf to know? The boss asked his deaf employee for something. racing for many years as jockey and trainer. phrase in his or her dictionary yet. may eliminate positions in the deaf teacher training program. not saying anything, at least publicly. Copyright 2018 by Barry Strassler, DeafDigest.